EVERETT, Wash. – Willie Spurr’s power play goal with 12 seconds left salvaged a road point for the Oly Town Artesians (1-0-1, 4 points) in a 7-7 draw at Sporting Everett (0-1-1, 1 point) on Saturday night. The goal capped off a four goal fourth quarter for the Artesians and finished a flurry that saw the two teams score three goals in the final minute and a half. Alex Castillo notched his first career hat trick for Oly Town, including two power play goals and the first goal of the fourth quarter to pull the Artesians within one. The testy and physical Everett squad committed seven blue card infractions and were shown two yellow cards in the game. Those seven blue cards resulted in five Artesians goals, including the game tying goal by Spurr that came just 30 seconds after Cesar Avila scored to put Everett up 7-6. Avila scored his goal just a minute after Oly’s Brandon Meyer tied the game at 6-6. The Artesians trailed 5-3 at the beginning of the fourth quarter and again by two at 6-4 before Matt Stalnik started the comeback with his own power play goal with 4:38 left to play. The game escalated quickly with Fabian Panduro scoring for Everett just 50 seconds in the first quarter. But Castillo answered on the next possession for Oly, evening the game back up at 1-1. Everett took a two goal lead into the second period but their tactics wore thin and Castillo and Andy Hyres netted goals with the man advantage to tie the game up at 3-3 at the half. Gustavo Rodrigues scored the first of his two goals on a power play to open the second half and Everett would add another minutes later and looked to be in control going into the fourth quarter. Rodrigues made it 6-4 on a penalty kick with 7:40 left in the fourth after Artesians keeper JJ Olson made a save that the officials said was just outside of the box. Oly was hit for three blue cards in the game with Everett converting on two of those, including the penalty kick goal. The tie was just the third tie in Western Indoor Soccer League history, and the second draw in team history. 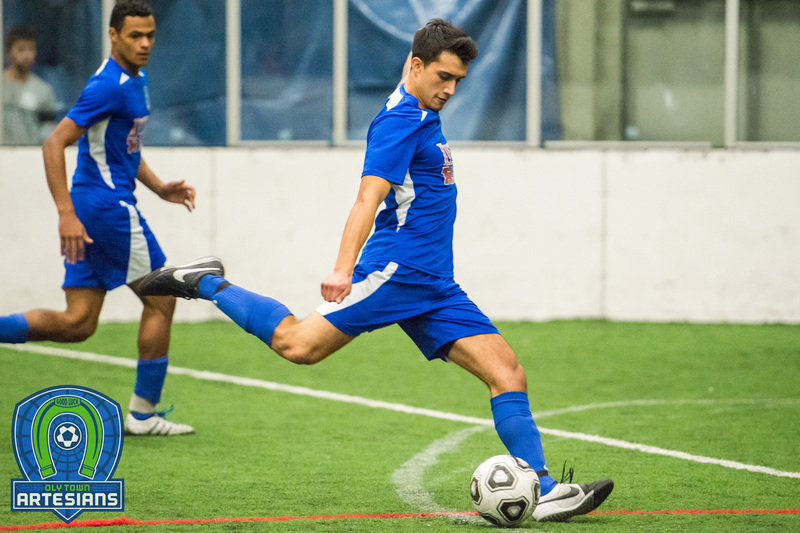 The Artesians drew with the Tacoma Stars Reserves, 5-5, in December of 2015. Bellingham United and Wenatchee have the other draw, a 6-6 affair in 2014. The Artesians take a break for the Thanksgiving holiday and then draw a bye week and will be back in WISL action on December 10th in Bellingham. They return home to face this same Sporting Everett squad on December 17th. First kick at The Pavilion is scheduled for 6:00 PM.